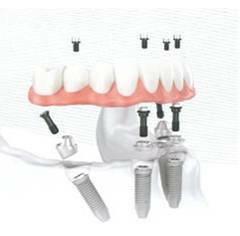 The All-on-4™ treatment gives patients with no remaining tooth a restoration using a minimum of 4 implants to support a fixed prosthesis, placed immediately after the surgery. The patient can therefore return home after the surgery with a fixed temporary prosthesis. Another advantage of the All-on-4™ method, is that it permits the installation of implants without the need of a bone graft. 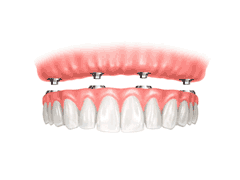 This technique is also aimed for patients who are on the verge of losing their teeth and who don’t want to be stuck with a conventional removable prosthesis. A just analysis and a good planning are essential for the success of this king of treatment. Therefore, the use of 3D scanning (osseous computed tomography) and of specialised software are also a part of the All-on-4™ concept. Thanks to this state-of-the-art technique, we can now stimulate the surgery beforehand and accomplish a treatment with great precision. To find out if you are a good candidate for the All-on-4™ procedure or for more information, book an appointment with Doctor Serge Chaussé for a free consult.